Remaining in London, we now travel back to the centre of our bustling metropolis to review another cleverly crafted retail emporium. Covent Garden has long since held a reputation for attracting an eclectic mix of high end retail, particularly independents with a penchant for individuality and creative flair. Located just off the main Piazza, on fashionable Henrietta Street, our next recently launched retail creation has all these characteristics and more. Here is a store that exudes brand heritage in an entirely contemporary fashion. 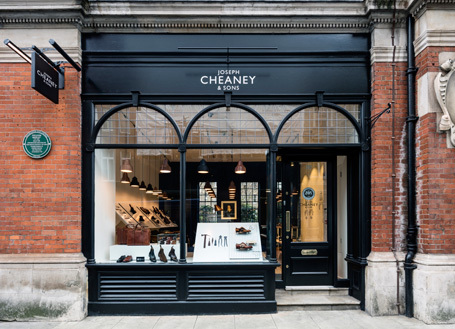 Joseph Cheaney & Sons has an inherent quality and craftsmanship that spans more than a century and is often lacking in much of our modern culture. This high end retailer has been designing and manufacturing every element of its shoes and boots from its factory in Northamptonshire since 1886. Whilst it has undergone numerous changes to stay afloat during a difficult history encompassing two world wars, it has remained true to its business ethos. The new store might be small but it is a perfect example of a great retail interior. The striking black exterior aptly frames the stylish interior, which can be glimpsed through the windows of the beautifully restored, historic facade. 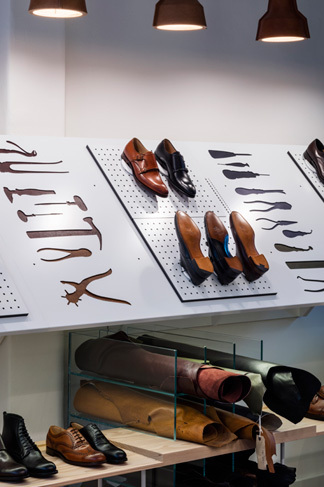 Relatively little product lies between you and the inside; a sloping board displays two pairs of shoes alongside detailed drawings of the shoemakers tools to hint at the handmade product. If you’re lucky you’ll see the staff polishing and shining the footwear on the polishing station in the window that doubles as a display counter and adds an element of retail theatre. You are immediately drawn into the well designed and beautifully presented high end establishment. Once inside a central display plinth appears to hover above the ground and footwear is neatly merchandised all around. Shoes are presented as exhibits to promote a gallery like feel where customers can experience the latest collections. Along the left perimeter wall another low display shelf rises up from the floor on legs so thin they are barely noticeable. The shelf also appears to float. Above it an angled board displays a limited range of shoes interspersed with storyboards. Patterns are cut out of the board to reveal hand finished Cheaney leather and silhouettes of traditional boot making tools follow on the art based theme. 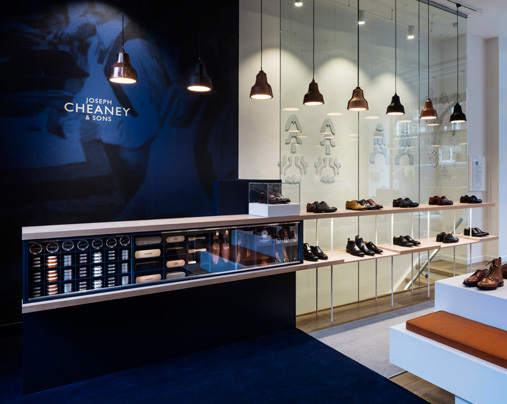 On the right side of the store a two tiered display unit showcases further footwear and is positioned in front of a glass wall that hides the staircase to the stockroom below ground. The lighting is of particular note; numerous pendant lights suspended from the ceiling in rows above the display tables and shelving create a dramatic effect. The shades are moulded leather and give a lovely warm glow. The main showroom has stark white walls, a white ceiling and a stripped wood floor, which is a complete contrast to the rear of the store. The entire area is painted a very dark blue, has very subtle lighting and has been carpeted in a deep blue. This is where the shoes are fitted. There is a leather sofa, an armchair, a coffee table, a lamp and an enormous, floor standing mirror. This is a very sultry and sophisticated section of the store. The sumptuous surroundings help to enhance your awareness of the premium nature of the product and help you part with your cash! Finally, a framed painting of the founder, Joseph Cheaney, is hung over the sofa to complete the look. This latest statement store is the sixth for the small chain and will undoubtedly raise brand awareness within this distinctive corner of London’s eclectic retail market. 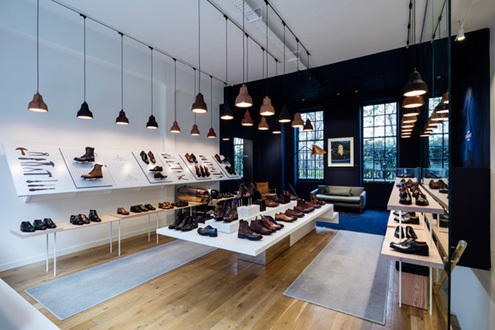 Designed by CK the store is the epitome of excellence for the prestigious British brand.